Beat and I are getting down to the wire with our Alaska preparations. We both have our gear strewn all over the house. Even though Beat is gearing up for a 1,000-mile expedition, I definitely have more stuff than him since I need gear for winter bike touring and bike commuting and overnight sled trips and racing. I'm fretting over how I can cull it down without leaving something crucial behind, and even then doubt I'll have room for anything else. Guess I'll have to wear the same jeans and T-shirt for a month. All of this flurry makes me feel like I won't have much else to write about until we get there. But if you haven't read this yet, I urge you to check out a profile I wrote about Tim Hewitt (link here), who's preparing to make his seventh trek to Nome, this time completely unsupported. In his own matter-of-fact way, Tim once talked me out of making a very bad decision. But then he effectively talked Beat into signing up for Nome, which could be considered a bad decision. So I guess in the grand scheme of the universe it all evens out. Regardless of his bad influence on Beat, Tim is a compelling athlete with an incredible story. I appreciate him taking the time to answer my questions. Total: 60.5 miles cycling, 26.7 miles running, 13,338 feet of climbing, 9:05 total time. Of course this is only six days of the week. Most weeks contain at least one longer (four-plus-hour) adventure, usually a mountain bike ride but occasionally a 50K trail race. (Training runs longer than 15 miles are a rarity for me. Usually if I have that much time to play outside I'd rather be cycling.) Also, I rarely take rest days, unless I'm either too busy to get outside, injured or sick, or —somewhat rarely — feel like I need the recovery. Limited rest days have been part of my workout habits since I took up daily outdoor activity back in 2005. And it's a reflection of my motivations. I like to focus on "fun" and "forever fitness" and skew my workouts toward activities that let me get outside for small-time adventures most every day, rather than lock myself to a plan that injects variable intervals of pain and recovery. I'm leery of risking my "forever fitness" on high-intensity workouts that carry a higher risk of injury. (This is especially true for running. I'm way more likely to peg it and often do when I'm cycling.) It's fine to want to be the fastest version of yourself, but speed has never interested me enough to pursue it with any passion. What sparks my passion is distance — the ability to travel under my own power over intriguing landscapes. I want to find out just how far I can go, and how efficiently I can run. I'm like the proud owner of a Toyota Prius. I may be puttering along the freeway as others zoom by, but darn it, I'm going to figure out how to get sixty miles per gallon, so I'll still be on the road long after the BMWs and even Subarus have exited for refueling. I realize there are better ways I could go about building endurance. But my way makes me happy and does seem to establish a solid base that allows me to say, "Multiple strenuous adventures to fill nearly every waking hour I spend in Alaska? Don't mind if I do!" 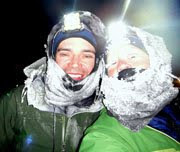 Beyond planning a few different multi-night bike tours, I also registered for another foot race — a 25-miler in Fairbanks. There's a decent chance I'll overdo it in Alaska because I have so much confidence in my endurance right now. I've been there (last spring, actually), and spent more than a month wondering where all of my energy went. But, as they say, if you want to discover how far you can go, you will risk going too far. I guess I'e seen about 10 summers more than you Jill, but it is the same reason I "play outdoors". To be fit enough to have a go at anything that comes along is a nice place to be. Have fun in Alaska. I am sure we are all looking forward to seeing some amazing pictures and reading some stirring prose during your visit(if you find the time to blog!). You are putting in a lot of miles, but do it while you can, as as office drone and freelance writer in my off time, my big miles are reserved for weekends. Sigh...better than nothing I guess. Although I certainly have a lot more flexibility these days, my weekly outside time was about the same back when I worked in offices. In Juneau I had what for me was a fantastic schedule (2 p.m. to 11 p.m.-midnight, 5 to 6 days a week.) Even though I commonly put in 50-plus hour weeks, I could always get out for 2 to 3 hours in the morning at least one full day on weekends. In Missoula I dealt with the 9 to 5 with lots of night outings, including some rather epic adventures with my friend Bill that kept us out until nearly midnight. When it comes to carving out lots of outdoor time, it does help to not have children, and also be the kind of person who doesn't prioritize cooking, cleaning, or shopping. Thanks for posting that—I like those numbers. I'm freelancing now (meaning, I'm more flexible on my time) and have a couple of larger trips I'd like to do. Thus far I haven't had a solid training schedule but now I have a better idea of what to shoot for! I love the term "forever fitness" - that gives me a new perspective from living with an engineer that always has to have a "training program" and wants me to be on a program! If I didn't enjoy rest days I wouldn't take them but I don't always feel like doing anything. Of course my options during the week are limited to darkness. Jill, let me know if there is gear that you need to borrow that you would use for our Denali trip. I'm happy to loan you gear that would assist and help you cut down on stuff to pack. See you sooooooooooon!